Daylilies are popular in home landscaping because of their attractive, strap-like foliage and wide variety of flower colors. They are easy to grow in many different soil and climate conditions, making them a winner for gardens everywhere. Each flower lasts for only one day, but during the blooming season plants produce new flowers every day. Some varieties bloom at night and have fragrant flowers. Especially effective in flower borders, each daylily can produce up to 400 flowers each summer. Daylilies are native to Asia and have been widely hybridized in the United States and England since the 1930s. Although they are called lilies, daylilies fall into the genus called Hemerocallis, which comes from Greek and means "day" and "beauty." In their native habitat, daylilies have flowers that are yellow, orange or red. Today, over 35,000 daylilies exist, with flowers that are white, pastel, pink, purple, nearly true-blue and multi-colored blends. Some are considered rare and sell for over $100 each. Check your nursery for varieties that do well in your part of the country. The following list represents some varieties that are appropriate for Minnesota. Apricot and peach colored daylilies include Bertie Ferris, Calumet, Doll House, Dress Circle, Little Rainbow and Ruffled Apricot. Bicolor daylilies include Becky Lynn, Bold One, Close Up, Karen Sue, Painted Lady, Sea Warrior, Shady Lady, and Toma. Gold flowers occur on Golden Chimes, Golden Gift, Golden Milestone, Golden Prize, Golden Trinkets, Ringlets and Stella de Oro. This is just a sampling: daylilies also come in red, pink, orange, white and yellow. Diploid plants contain two identical sets of chromosomes in each cell, while polyploids have more than two sets. Within this category, triploids have three sets of chromosomes and tetraploids have four. Diploid daylilies outnumber the tetraploids, although tetraploid flowers are usually larger and their flowers are more intensely colored. Many people consider tetraploids to be more vigorous growers than the diploids. Also, they have greater possibilities for breeding because of the larger number of chromosomes. Expect your daylilies to bloom from early spring through fall, depending on the type you grow and your climate. Although one type of daylily might bloom most abundantly from May until July, you can enjoy constant color in your garden by planting different varieties that bloom at different times. For example, "extra early" plants bloom in spring, while "midseason" lilies bloom from May to July. If you want fall flowers, grow a "very late" type. Daylilies have specific preferences about where they grow. Some do well in one region of the country while others do not. Local nurseries carry cultivars that are adapted to their areas, so for the best success, check with them and rely on their choices instead of ordering from a catalog. 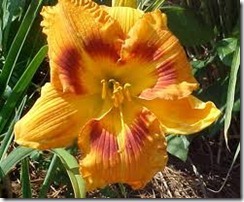 Plant daylilies in an area that receives at least 6 hours of sun daily. Soil should be slightly acidic and moist. Dig in compost before you plant.